Monte Gordo is situated on one of the finest beaches of the Eastern Algarve, and has been transformed from a minor fishing village into a modern and popular resort town. During the summer Monte Gordo has a buzzing atmosphere, attracting a wide selection of nationalities, including many Portuguese, who simply adore the region. Monte Gordo is no charming or historic Portuguese town; it is a modern beach resort, and for this one aspect the town excels at. The beach of Monte Gordo is simply stunning, with miles of golden sands, which are lapped by clean and safe sea waters. In the town, there is a diverse selection of restaurants catering for every cuisine and taste, while the nightlife is relaxed and social, focused around late-night bars and restaurants. Monte Gordo’s calm ambience makes it ideal for families and, as the town is primarily aimed for Portuguese tourists, it offers exceptional value for money. An entire holiday to Mote Gordo could be easily spent lounging on the glorious beach, but there is a lot to see and do within the eastern Algarve. Just a short train ride away is the historic town of Tavira, to the north are the castles of Castro Marim, and pretty Vila Real de Santo António opens out onto the Guadiana River and the Spanish border. A glass of Sagres beer makes a great night in Monte Gordo! Monte Gordo may not be as well-known as the resort towns of the central or western Algarve, but there is a lot going for it, especially for a beach holiday. This guide will provide an introduction to Monte Gordo and is written for visitors who are considering a holiday to this wonderful region. •	Explore Vila Real de Santo Antonio, with its impressive baroque architecture. Who Should Visit Monte Gordo? 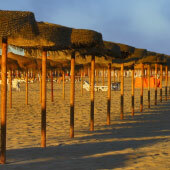 Monte Gordo is ideal for, families with younger children, older couples and visitors who are purely after a great beach. Monte Gordo is not suited for groups, partygoers, or visitors wanting a delightful Portuguese town mixed with an immersion into their culture. Monte Gordo is great for toddlers and young children as the beach is one of the safest of the Algarve, with small waves and no strong currents. The town has a calm environment and does not have any of the excessive drinking culture or loutish behaviour found in the larger resorts, such as Albufeira or the Spanish Costas. More mature visitors will enjoy Monte Gordo as the town has a very welcoming attitude and the atmosphere is relaxed and social. For those visitors purely after a great beach will struggle to find better in Western Europe. Teenager families should consider the central Algarve as Monte Gordo is a long way from the excitement and theme parks, for which the Algarve is famed for. Partygoers will be disappointed with Monte Gordo, as there are is no banging or crazy nightlife. Monte Gordo is least suited for cultural or touring visitors, as the huge white washed apartments have eradicated any remnants of the once fishing village. The closest tourists to Monte Gordo will come to any Portuguese culture is eating sardines or drinking Sagres beer in one of the many cafes. Simply put, if a wonderful beach and a glorious climate are the only requirements for your holiday then Monte Gordo is excellent choice, but if you wish more consider elsewhere. The height of the summer season for Monte Gordo is from July through to August, during this season the hotels are full, restaurants are busy and there is a great atmosphere around the town. Weather is suitable for spending time on the beach from May until the end of September and outside of the summer season hotel bargains can be found but the town will feel much quieter. Monte Gordo closes down for the winter and the weather of this season is mild with an equal number of wet days as bright sunny days. For a winter holiday to the Algarve head to the towns which have a large permanent population such as Lagos, Praia da Rocha or Albufeira. Does Monte Gordo Have Good beaches? The main attraction of Monte Gordo is the wonderful sandy beach that extends for 14km from the town of Altura to the mouth of the Guadiana river. Unlike the western Algarve, which has steep cliffs, the beach at Monte Gordo is on the same level as the town and is suitable to access for all visitors. The beach is both long and wide so that even at the height of the season there is plenty of space for all. The waters are crystal clear but are surprisingly cold, only reaching a maximum of 24C in the summer. The waters are chilly as they are fed by the Atlantic Ocean and not the warmer Mediterranean seas. For families, the sea waters are clean and calm, idea for children splashing around in and the beaches are supervised by life guards during the summer. Where to stay in Monte Gordo? Monte Gordo is a relatively small and no hotel (that is in the town) is more than a couple minutes walk from the beach or the main promenade of shops and restaurants. Always check reviews of hotels to select the best for your budget but do be wary of very old reviews. 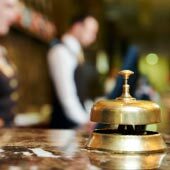 For the latest reviews and booking of hotels click here. From the Airport to Monte Gordo? The main international airport of the Algarve is Faro airport which is centrally located along the southern coastline. Monte Gordo is located 60km to the east of Faro and it is advisable to organise a pre-arranged pick up from the airport due to the limited public transport connections. Never get a taxi from the airport to Monte Gordo as this will be very expensive. Airport to Hotel by Public Transport? 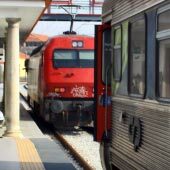 Monte Gordo has limited bus and train services from Faro. Faro town centre is a 10 minute taxi ride from the airport (€ 12-15) and the train and bus station are only 200m apart. The train is the more relaxing method of travel (€5 single ticket) but there are only 11 daily departures. From the train station it is a 1km walk to the resort centre. If there are no suitable train departures head to Faro bus station and catch the bus. Bus and train travel is safe even on the late night services. What is there to do in Monte Gordo? 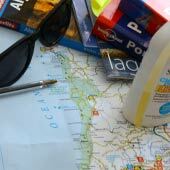 This guide lists the main activities in Monte Gordo. The main activities are the beach, cycling/walking along the coastline or day trips to Vila Real, Castro Marim, Ayamonte and Tavira. There are three excellent golf courses close to Monte Gordo. For a holiday to Monte Gordo there is no need to rent a car as all day trips can be easily reached using public transport. The advantage of a car is it makes the transfer from the airport much easier and does open up more of the surrounding area. When renting a car always be aware of the high excess for insurance, which is usually around €1,000. Further insurance can be purchased to remove the excess (€10-15 a day) but it is a sneaky additional cost which is paid locally Portugal – all Portuguese rental companies apply this excess. 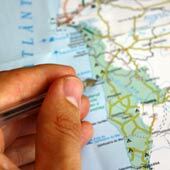 If you wish to cross the border into Spain always check with your rental company that you are insured. To the east of Monte Gordo is the largest forest of the Algarve, the Mata Nacional da Dunas Litorais de Vila Real de Santo Antonio. This natural park has a unique ecosystem of pine forests that cover the sand dunes of the region. The forest is the perfect place to escape the summer crowds and there are pleasant shaded footpaths across the 440 hectares of forest. Is language going to be an issue? 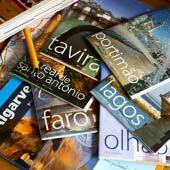 Everyone who works in the tourist trade can speak English fluently. English is used as the second language and no visitor will experience any difficulties communicating. All restaurants will have English menus and home cuisine can be easily found.